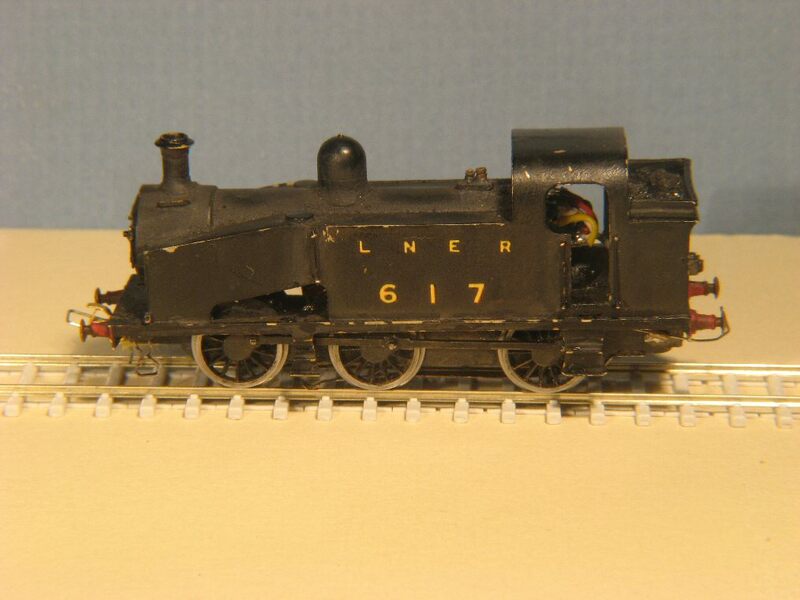 The Copenhagen Fields J50 (which works "Mrs Wilberforce' Yard") came to me to have DCC controlled couplings fitted. The rear coupling mechanism was locoated above the gearbox. Unfortunately, the loco has frames with a ferrous content, so they overwhelm the magnetic fields. Inspite of a nifty trick to lift the loop of a DG coupling, the magnetic field issues around the front has defeated me. The paint on the loco is looking a bit battered, must get a hard life on the exhibition circuit. The coil for the rear coupler is fitted above the gearbox. The long rotating operating rod goes above the rear wheel, and a bit of neat bending at the end of the wire forms the hook for DG couplings on a wagon. The operating rod has various bends in it to clear bits of chassis. 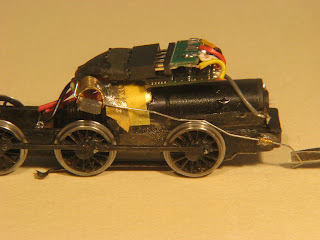 The DCC chip is fitted below the socket; a socketted arrangement was used so that the loco can be rapidly swapped back to analogue operations with a blanking plug (though will loose the remote control of coupler).